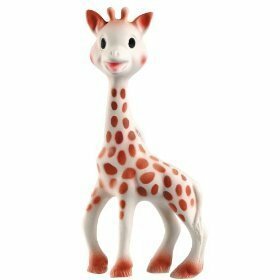 Baby Things I Want: Sophie the Giraffe: What's the Big Deal? Sophie the Giraffe: What's the Big Deal? I couldn't resist. I needed to see what all the hype was about. I'd seen Sophie the Giraffe at other people's houses, and didn't get what the big deal was. But, I thought, maybe you had to OWN a Sophie to truly understand. Some very lucky Frenchman hit the jackpot when his silly little teether became trendy. Now, here's the embarrassing part: After making it very clear that I am not impressed with Sophie, I do have to admit that owning Sophie makes me feel like part of some posh club. Here's a guess: I bet that among the people who own Sophie the Giraffes, there are more Bugaboo owners than there are Graco owners. Or, put another way, I'll bet that Bugaboo owners are much more likely to buy Sophie the Giraffe than are Graco owners. And while I certainly can't afford to be in the Bugaboo club by buying an actual Bugaboo, it's nice to feel like I've got loads of money to splurge on silly baby things by sacrificing a mere $17. Sophie is made of 100% rubber. She is BPA-free and painted with "food paint." She squeaks when you squeeze her. You can now join the thousand of proud Sophie owners in Israel too!